The original version of this article was revised: The name of author should be José Manuel García-Aznar (García-Aznar, JM) from José Manuel García Aznar (Aznar, JMG). Two affiliations “Department of Electronics, University of Barcelona, Martí i Franquès 1, E-08028 Barcelona, Spain” and “Centro de Investigación Biomédica en Red en Bioingeniería, Biomateriales y Nanomedicina (CIBER-BBN), 28029 Madrid, Spain” were also added for Josep Samitier. The online version of this article (doi: 10.1007/s12035-017-0451-4) contains supplementary material, which is available to authorized users. An erratum to this article is available at https://doi.org/10.1007/s12035-017-0553-z. The cellular prion protein (PrPC), a glycosylphosphatidylinositol (GPI)-anchored protein, participates in several neural functions [1, 2, 3]. Relevantly, one of the most recently described functions of the protein points to PrPC is as a receptor for β-amyloid (Aβ) . Indeed, today it is well established that Aβ oligomers can bind with great affinity to PrPC [5, 6, 4, 7, 8] and to recombinant prion protein (e.g. [9, 10]). 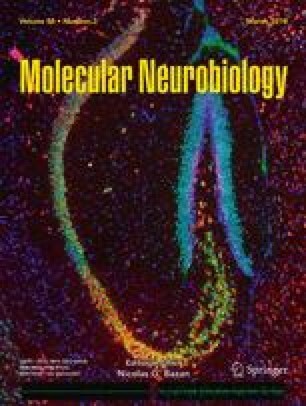 After binding, it was also proposed, although with some controversy [9, 11, 12, 13], that this interaction plays a crucial role in neurotoxic effects of Aβ oligomers such as inhibition of long-term potentiation (LTP), neuronal cell death and memory impairment in some mouse models of Alzheimer’s disease [14, 6, 4, 15, 16, 17]. Amyloid aggregates are present in many neurodegenerative diseases, and their formation occurs in a multistep process including the misfolding of healthy soluble proteins and their association into amyloid fibrils that form cell inclusions. In fact, among other aggregates (e.g. SOD1, CEPB3, TDP-43, etc. ), those of Tau and α-synuclein, characteristic of tauopathies/Alzheimer’s disease and Parkinson’s disease, respectively, showed cell-to-cell transport in healthy cells through their uptake of misfolded polymers, which can propagate and spread throughout the neural parenchyma [18, 19, 20, 21, 22, 23]. α-Synuclein is a key player in the pathogenesis of synucleinopathies, including Parkinson’s disease, dementia with Lewy bodies and multiple system atrophy . Transmission of synthetic α-synuclein aggregates has been demonstrated in several cellular and animal models (see [25, 26, 27] for reviews). Several groups have reported that α-synuclein shows prion-like propagation in wild-type mice [28, 29, 30]. However, the basis of the spreading process remains poorly understood although cell-to-cell transport via exocytosis has been suggested [31, 32, 33]. For this reason, PrPC is proposed as an Aβ receptor (see above), and in this study, we aimed to explore whether PrPC is involved in the propagation and spreading of α-synuclein. Results demonstrated that α-synuclein could propagate and spread in mice lacking or overexpressing Prnp, including wild-type mice. However, increased quantities of p-α-synuclein can be seen in the motor cortex of PrPC-overexpressing mice as compared to Prnp +/+ and Prnp 0/0 mice. In addition, in vitro experiments also corroborated that although not required to trigger α-synuclein transport, Prnp overexpression enhances transported α-synuclein. In fact, α-synuclein binds strongly to Prnp-transfected HEK293 cells in contrast to mock-transfected ones. Moreover, the absence of the charged cluster (CC) domain of PrPC impairs α-synuclein binding in transfected cells. In conclusion, our results point to a non-mandatory but relevant role of Prnp in α-synuclein transport. Adult male C57Bl6/129sv-Prnp 0/0 (B6129 Prnp Zrchl/Zrchl Zurich I) mice were purchased from the European Mouse Mutant Archive (EMMA, Monterotondo, Italy) . We backcrossed to C57BL/6 J for at least 8–9 generations to obtain 6–7% of 129 microsatellites in B6.129 Prnp 0/0 and control littermates B6.129 Prnp +/+ . These Prnp 0/0 and Prnp +/+ mice were used in the present study. Specific primers for Prnp genotyping were designed in our laboratory based on the original P3 and P10 primers as described : neo: 5′-gccttctatcgccttcttgac-3′; 3′ NCnew: 5′-gctacaggtggataacccctc-3′ and P10new: 5′-cataatcagtggaacaagccc-3’ . Forty cycling conditions were 45″ 95 °C; 45″ 62 °C; 1′ 72 °C, followed by a final extension at 72 °C for 5 min. Prnp-overexpressing mice (Tga20) were purchased from EMMA (Monterotondo, Italy). They were generated as described by Marek et al. and backcrossed in our lab with B6.129 Prnp 0/0 mice for seven generations . The backcrossed mice were used in the study. For Tga20 mice, the transgene was detected using primers specific to the Tg20 allele 5′-caaccgacgtgaagcattctgccta-3′ and 5′-cctgggactccttctggtaccgggtgacgc-3′ as indicated . The Ethics Committee on Animal Experimentation (CEEA) of the University of Barcelona approved all procedures described in this study. All housing, breeding and procedures were performed under the guidelines and protocols #276/16 and #141/15 of CEEA. Mouse and human α-synuclein complementary DNAs (cDNAs) in bacterial expression plasmid pRK172 were used. α-Synuclein was expressed in Escherichia coli BL21 (DE3) cells and purified using boiling, Q-sepharose ion exchange chromatography and ammonium sulphate precipitation. Purified α-synuclein protein was dialyzed against 30 mM Tris–HCl, pH 7.5, and cleared using ultracentrifugation at 113,000g for 20 min. Protein concentration was determined with reverse phase HPLC. Proteins were loaded on an Aquapore RP-300 column (Brownlee) Perkin Elmer (Waltham, MA, USA) (equilibrated in 0.09% trifluoroacetic acid with a linear gradient of acetonitrile 0 to 50% at a flow rate of 1 ml/min). Purified mouse α-synuclein monomer (7 mg/ml) in 30 mM Tris–HCl, pH 7.5, containing 0.1% NaN3, was incubated at 37 °C in a shaking incubator at 200 rpm for 72 h. α-Synuclein fibrils were pelleted by spinning at 113,000g for 20 min and then suspended in PBS. α-Synuclein fibrils were sonicated with an ultrasonic homogenizer (VP-5S) Taitec (Nishikata, Japan) (at high power for 10 cycles (30 s on, 30 s off at 10 °C) before use. Aliquots of sonicated and non-sonicated fibrils were processed for transmission electron microscope (TEM) analysis and negative staining (Supplementary Fig. 1). In parallel, SDS-PAGE and western blot revealed the presence of a relevant 17 KDa and upper bands >35 KDa after sonication typical of protofibril preparations (Supplementary Fig. 1). To determine the concentration, fibrils were dissolved in 7 M guanidine hydrochloride and analysed with RP-HPLC as described above. Generated fibrils were tested to insure that they were endotoxin-free to avoid unwanted effects as described . Fibril solutions were fixed to carbon-forward-coated copper supports, and negative staining was performed using a 2% PTA-based (phosphotungstic acid) stain (pH 7.4), after which samples were placed in silica-based desiccant for a minimum of 2 h. Finally, we proceeded to TEM observation using a Leica electron microscope (Wetzlar, Germany) at SCT, University of Barcelona, Barcelona, Spain (Supplementary Fig. 1). Five- to 6-month-old mice were anaesthetised with 50 mg/kg pentobarbital sodium and then were unilaterally injected with 5 μg (1 μg/μL solution) of recombinant mouse sonicated α-synuclein into postcommissural striatum (A-P 3.5 mm; M-L: 3.5 mm; D-V −0.9 mm from Bregma) at a rate of 0.1 μL/min. In parallel, some mice (n = 3) were sham-operated (Supplementary Fig. 1d). In these mice, the skull was opened and a glass pipette was placed in the abovementioned coordinates. After 10 min, the pipette was removed and the skin sutured. Sham-operated and fibril-injected mice were anaesthetised 45 days later with isofluorane and perfused with 4% buffered paraformaldehyde (pH 7.3). For immunohistochemistry, free-floating sections were rinsed in 0.1 M PBS, and endogenous peroxidase activity was blocked by incubation in 3% H2O2 and 10% methanol dissolved in 0.1 M PBS. After extensive rinsing, sections were incubated in 0.1 M PBS containing 0.2% gelatin, 10% normal serum, 0.2% glycine and 0.2% Triton X-100 for 1 h at room temperature. Afterwards, the sections were incubated for 24 h at 4 °C with the primary antibody: p-α-synuclein (p129S, clone 81A (cat. ab184674), 1:2000 diluted, Abcam, Cambridge, UK). After that, the sections were incubated with secondary biotinylated antibodies (2 h, 1:200 diluted) and streptavidin-horseradish peroxidase complex (2 h, 1:400 diluted). Peroxidase activity was revealed with 0.025% diaminobenzidine (DAB) and 0.003% hydrogen peroxide. After rinsing, the sections were mounted onto slides, dehydrated and coverslipped with Eukitt™ (Merck, Darmstadt, Germany). Samples were photodocumented using an Olympus (Hamburg, Germany) BX61 microscope equipped with a cooled digital DP72L camera. For quantification of Lewy body-like (LBL) p-α-synuclein-positive aggregates in motor cortex, equivalent sections at the level of the frontal cortex between Bregma 0 and 1 were selected (2–3 sections per mouse), and the total number of neuronal aggregates (LBL) of p-α-synuclein in layer V (300 μm w × 150 μm h box) was counted using a ×40 objective (oil immersion Zeiss, N.A. 0.85). Statistical analysis of the obtained data was performed with Bonferroni post hoc test (multiple comparison test) using GraphPad Prism 6 (Mac OsX, Graphpad). Data are presented as mean ± standard error of the mean (SEM). Differences between groups were considered statistically significant at **P < 0.01 and *P < 0.05. Two different devices were used in an optimized modification of our previous design of large dual-chamber, open neuronal co-culture and of designs reported by Taylor et al. . The open microfluidic device consists of two main open chambers interconnected by 100 microchannels. The large chamber areas (9 mm × 16 mm) facilitate effective cell culture and easy handling. The small cross-section areas of microchannels (3 μm × 10 μm or 10 μm × 10 μm) restrict the crossing of cortical neuron cell bodies but permit the passage of neuronal processes. The microfluidic device was made of poly(dimethylsiloxane) (PDMS) using standard photolithography and soft lithography. E15.5 mouse embryo brains were dissected and washed in ice-cold 0.1 M phosphate-buffered saline (PBS) containing 6.5 mg/ml glucose. The meninges were removed and the cortices isolated. Tissue pieces were trypsinized for 15 min at 37 °C. After the addition of horse serum and centrifugation, cells were dissociated by trituration in 0.1 M PBS containing 0.025% DNAse with a fire-polished pipette. Dissociated cells were plated at ~10,000 cells/mm2 on one of the two reservoirs of microfluidic devices (A and B in Fig. 3) coated with poly-D-lysine (Sigma, Madrid, Spain). The culture medium was Neurobasal supplemented with 2 mM glutamine, 6.5 mg/ml glucose, antibiotics and B27 (Invitrogen-Life Technologies, Barcelona, Spain). After 72 h, 5 μM AraC (cytosine β-D-arabinofuranoside hydrochloride, Sigma) was added for 48 h to inhibit the growth of dividing non-neuronal cells. For characterization, cultures were immunostained using anti-glial fibrillary acidic protein (GFAP, cat. z0334; 1:500, Sigma), basic helix-loop-helix (bHLH) transcription factor olig2 (cat. AB9610, 1:200; Abcam) and class III β-tubulin (TUJ1, cat. 801201, 1:3000; Biolegend, CA, USA). Cultures contained up to 90% neurons (TUJ1-positive) and were used after 5–7 days in vitro. In parallel, some cultures were stained with Fluo4-AM (1 mg/ml, F14201, Invitrogen-Life Technologies) to confirm axonal interconnection between reservoirs prior to their processing. Mouse PrPC-encoding plasmid (pcDNA 3.1 backbone) and PrPC-IRES-GFP were provided by D. A. Harris (Boston University School of Medicine, Boston, MA, USA) and PrPC-truncated form ΔF35 by A. Aguzzi (University Hospital Zürich, Institute for Neuropathology, Switzerland). To generate deletion constructs ΔCD, ΔCC, ΔHR and ΔCR, the PrPC-encoding plasmid was used as a template for inverse PCRs, and the inserts obtained were fused. Briefly, a primer set was designed for each construct in order to amplify the entire plasmid, except for the region of Prnp to be deleted, i.e. regions 95–133, 95–110, 112–133 and 105–125 for ΔCD, ΔCC, ΔHR and ΔCR, respectively. Primers (Ecogen) were as follows: CD (F: 5′-AGCAGGCCCATGATCCATTTTG-3′, R: 5′-ATGGGTACCCCCTCCTTGGC-3′); CC (F: 5′-GTGGCAGGGGCTGCGGCAG-3′, R: 5′-ATGGGTACCCCCTCCTTGGCC-3′); HR (F: 5′-AGCAGGCCCATGATCCATTTTG-3′, R: 5′-TGCCACATGCTTGAGGTTGG-3′); CR (F: 5′-TACATGCTGGGGAGCGCC-3′, R: 5′-TTTTGGTTTGCTGGGCTTGTTC-3′). After amplification (Accuprime Taq Polymerase™, Invitrogen), the blunt ends of the amplimers were phosphorylated using the T4 kinase reaction (Invitrogen) and then religated (Fast-Link Ligase™, Epicentre Biotech.). An aliquot of each ligation reaction was electroporated into Escherichia coli DH5α, and transformants were selected for ampicillin resistance. Twenty-five candidates were selected and screened with sequence analysis (Terminator Big Dye™ v3.1, Applied Biosystems). HEK293 cells (ATCC CRL-1573™, American Type Culture Collection, MD, USA) were maintained in Dulbecco’s modified eagle medium (DMEM, Invitrogen-Life Technologies), 10% foetal bovine serum (FBS, Invitrogen-Life Technologies) and 1% penicillin/streptomycin (Invitrogen-Life Technologies) in 75 cm2 culture bottles in a 5% CO2 atmosphere at 37 °C. One day before transfection, cells were cultured in DMEM supplemented with 10% FBS and without antibiotics, on poly-D-lysine (Sigma) coated plates. Transfection was performed using Lipofectamine Plus (Invitrogen-Life Technologies), according to the manufacturer’s instructions as indicated . Twenty-four hours after transfection, cells were scraped and lysed for 20 min on ice in cold lysis buffer (50 mM Hepes pH 7.5, 150 mM NaCl, 1.5 mM MgCl2, 1 mM EGTA pH 8, 10% glycerol, 1% Triton X-100) containing 1x protease inhibitor cocktail and phosphatase inhibitors. Lysates were centrifuged at 12000g for 5 min at 4 °C and supernatants were collected. Protein concentration was determined using a BCA protein assay kit (Pierce). The caspase-3 activity assay, with Ac-Asp-Glu-Val-Asp-7-amino-4-trifluoromethylcoumarin (Ac-DEVD-AFC, Sigma) as a substrate, was performed as previously described . One day before transfection, counted HEK293 cells were seeded onto poly-D-lysine (0.01 μg/μl) coated glass coverslips (12 mm Ø). Three days post-transfection, mouse α-synuclein (1 μg/ml medium) was added to the culture media. Treatment with α-synuclein was maintained for 3 days. Cells were fixed in 4% buffered paraformaldehyde (Sigma) and then permeabilized with 0.1% Triton X-100 (Sigma) in 0.1 M PBS. A similar fixation procedure was used for microfluidic devices (see  for details). After fixation, and extensive rinsing with 0.1 M PBS, cultures were blocked with 10% FBS in 0.1 M PBS prior to incubation with primary antibodies. Neurons were identified using a class III β-tubulin antibody (1:3000 diluted; Biolegend). PrPC was detected using anti-mouse 6H4 (1:500, Prionics; Schlieren, Switzerland), which recognizes the sequence DYEDRYYRE of the prion protein (human PrPC: aa 144–152), α-synuclein (1:500 diluted; Cell Signalling) and p-α-synuclein (mouse and human) (p129S/81A; 1:400 diluted; Abcam). After incubation with primary antibodies, cells were incubated with the pertinent Alexa Fluor-tagged secondary antibodies (Alexa-488 goat anti-mouse or Alexa-568 goat anti-rabbit) (Invitrogen-Life Technologies). Finally, cells were stained with 0.1 μM DAPI (Sigma) diluted in 0.1 M PBS, mounted on Mowiol™ (Calbiochem, San Diego, CA, USA) and viewed using an Olympus BX61 fluorescence microscope. Samples were homogenized in 10% wt/vol of 50 mM Tris–HCl, pH 7.4/150 mM NaCl/0.5% Triton X-100/0.5% Nonidet P-40, and a mixture of protease inhibitor cocktail (Roche, Basel, Switzerland) and phosphatase inhibitors (10 mM tetra-sodium pyrophosphate, 200 μM sodium orthovanadate and 10 mM sodium fluoride). After this, samples were centrifuged at 15,000g for 20 min at 4 °C. The resulting supernatant was normalized for protein content using BCA kit (Thermo Scientific Pierce, Paisley, UK). Cell extracts were boiled at 100 °C for 10 min, followed by 6% SDS electrophoresis and were then electrotransferred to nitrocellulose membranes for 1 h at 4 °C. Membranes were then blocked with 5% fat milk in 0.1 M Tris-buffered saline (pH 7.4) for 1 h and incubated overnight in 0.5% blocking solution containing primary antibodies. After incubation with peroxidase-tagged secondary antibodies (1:2000 diluted, Sigma), membranes were revealed with an ECL-plus chemiluminescence western blot kit (Amershan-Pharmacia Biotech, Piscataway, NJ, USA). In some experiments, peroxidase activity was revealed using a high sensitivity ECL-chemiluminescence kit (QuantaRed™, Thermo Scientific). In our experiments, each nitrocellulose membrane was used to detect α-synuclein (1:1000; Cell Signalling), p-α-synuclein (1:1000, p129S/81A; Abcam), β-actin (1:20,000; Sigma), β-tubulin (1:10,000; Sigma) and class III β-tubulin antibody (1:5000; Biolegend). For quantification, developed films were scanned at 2400 × 2400 dpi (i800 MICROTEK high quality film scanner), and the densitometric analysis was performed using the Quantity One Image Software Analysis (Biorad, Barcelona, Spain). Statistical analysis of the obtained data was performed with Bonferroni post hoc test (Multiple comparison test) using GraphPad Prism 6 (Mac OsX, Grahpad). Data are presented as mean ± SEM. Differences between groups were considered statistically significant at *P < 0.05. Adult Prnp +/+ , of recombinant endotoxin-free mouse α-synuclein (Fig. 1) in the postcommissural striatum, and the presence of phosphorylated α-synuclein (p-α-synuclein, p129S/81A–positive), were analysed 45 days later. Both sham- and non-operated mice presented the described pattern of p-α-synuclein in the adult mouse telencephalon (Supplementary Fig. 1, ). The antibody p129S/81A showed minor cross-reactivity with phosphorylated Neurofilament L. Indeed, several telencephalic regions showed background staining including the cingulate and parietal neocortex, hippocampus, striatum and some telencephalic axonal tracts (e.g. mamillothalamic tract) (Supplementary Fig. 1) . However, aggregated forms of p-α-synuclein such as Lewy body-like (LBL) or Lewy neurite-like (LNL) forms were never observed after immunohistochemistry using the p129S/81A antibody in the telencephalon of non-operated and sham-operated mice, only appearing in the telecephalon after α-synuclein fibril injections (Supplementary Fig. 1). High magnification of LBL observed in the neocortex and amygdala 45 days after mouse α-synuclein striatal injections can be seen in Supplementary Fig. 1f, g. As observed, these aggregates were clearly identifiable over the background even using Ni-DAB development. As indicated, the mice were processed after 45 days post-injection (Prnp +/+ (n = 6); Prnp 0/0 (n = 6) and Tga20 (n = 7)) in order to determine whether the regional distribution of p-α-synuclein was similar in the different Prnp genotypes (Figs. 1 and 2, Supplementary Fig. 1). Injection of mouse α-synuclein sonicated fibrils into postcommissural striatum induced p-α-synuclein pathology bilaterally throughout the brain, including striatum, amygdala, stria terminalis, substantia nigra and neocortex (Figs. 1 and 2, Supplementary Fig. 1). The anatomical and cellular distribution of p-α-synuclein aggregates was observed in Prnp +/+ , Prnp 0/0 and Tga20 mice, as previously reported for wild-type mice in another study using similar α-synuclein fibrils and protocols . At the cellular level, p-α-synuclein was mainly located in neurites and the neuronal perikaryon (as thick LBL or LNL aggregates) (Figs. 1 and 2, Supplementary Fig. 1e, f). At these post-inoculation times, p-α-synuclein labelling was observed bilaterally in the striatum, substantia nigra, amygdala, and entorhinal cortex and, ipsilaterally, in the motor cortex. However, although α-synuclein pathology was observed in the absence of Prnp, histological examination and quantitative analysis of genotypes determined increased p-α-synuclein staining as LBL in the ipsilateral motor cortex of Tga20 mice compared to Prnp 0/0 and Prnp +/+ (Prnp 0/0 = 11.86 ± 0.91; Prnp +/+ = 19.80 ± 2.25; Tga20 = 27.56 ± 2.19 (mean ± SEM). Prnp 0/0 vs Prnp +/+ , mean diff −7.94, t = 2.669, 95% CI of diff = −15.63 to −0.2592. Prnp 0/0 vs Tga20, mean diff −15.70, t = 5.159, 95% CI of diff = −23.56 to −7.84. Prnp +/+ vs Tga20, mean diff −7.756, t = 2.795, 95% CI of diff = −14.92 to −0.59; ANOVA Bonferroni multiple comparison test) (Fig. 2). These data strongly suggest that although non-mandatory, Prnp overexpression enhances the regional transport of p-α-synuclein pathology in living mice. α-Synuclein intracellular transport has been studied in vitro using commercial microfluidic devices (e.g. [45, 46, 47, 48]). Our laboratory has developed two microfluidic designs based on previously published devices of our group (Fig. 3) . Two different types of microgrooves (both 1 mm length) were generated for this study: 100 microgrooves of 3 μm (high) × 10 μm (wide) sections and 100 microgrooves of 10 (high) × 10 μm (wide) sections (Fig. 3a). Results in protein transport were similar for the two devices since microfluidic pressures were controlled to avoid non-specific non-neuronal transport (see below). As noted, α-synuclein transport in vitro can be done both anterogradely and retrogradely [45, 46, 47]. Thus, we cultured Prnp +/+ embryonic (E15.5) cortical neurons for 5–7 days in our devices to ensure crossing of axons between A and B. Under these conditions, around ≈85% of the devices showed large numbers of crossing axons after Fluo4-AM staining between reservoirs (Supplementary Fig. 2a, b). In addition, immunohistochemical analysis demonstrated that a large number of TUJ1-positive neurons with fewer astrocytes (glial fibrillary acidic protein (GFAP)-positive) and oligodendrocytes (olig2-positive) were observed in the devices (Fig. 3b, c). Recombinant (1 μg/ml) mouse (Fig. 3) or human (Supplementary Fig. 3) α-synuclein fibrils were added to one of the reservoirs (mainly in A; (A *) in Fig. 3) following the protocol of  with different volumes of medium between reservoirs (B > A; 100 μl), and their transport (A ⇒ B) were analysed 5 days later with immunocytochemistry (Fig. 3d–h, Supplementary Fig. 3) or western blot (Fig. 3i and Supplementary Figs. 2 and 4). First, we aimed to determine endogenous α-synuclein and p-α-synuclein labelling in our devices. At these stages, a very low α-synuclein immunostaining was observed in untreated devices in both A and B reservoirs. In addition, after using the p-α-synuclein (p129S/81A) antibody, no labelling was observed in the absence of α-synuclein fibril cultures. However, after α-synuclein fibril treatment in A (Fig. 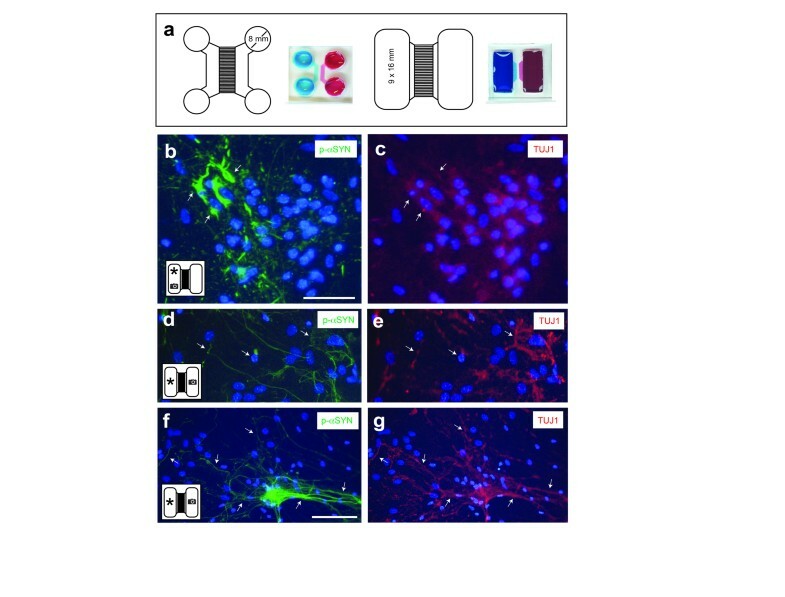 3d), immunoreacted cultures showed the presence of relevant α-synuclein staining in the perikaryon, neurites and axons of cultured TUJ1-positive neurons in B (Fig. 3d). In addition, relevant p-α-synuclein labelling was observed in morphologically identified neurons located in both reservoirs (A and B) (Fig. 3e–h). More relevantly, p-α-synuclein aggregates (after mouse or human fibril treatment) were detected in identified axons and in the cytoplasm of cultured neurons in A as well in B (Fig. 3e–h, Supplementary Fig. 3b–g). In addition, to avoid the presence of passive transport of α-synuclein, we developed the detection of the protein in cell extracts and media of both reservoirs using the QuantaRed™-enhanced chemifluorescent HRP substrate (Thermo Fisher, cat. 15159) (Fig. 3i and Supplementary Figs. 2 and 4). 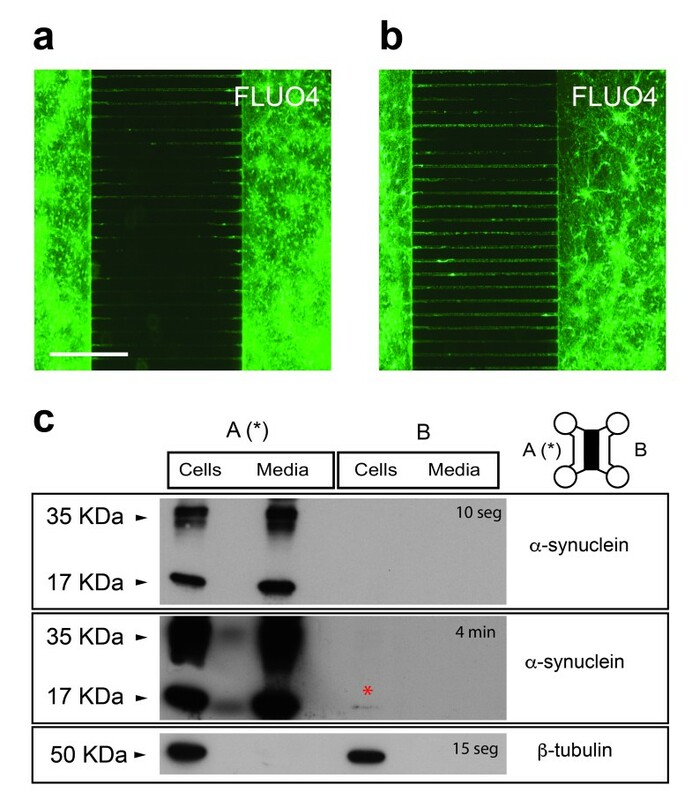 After mouse α-synuclein fibril incubation in A, results revealed the presence of α-synuclein in both cellular extracts (A and B), with the absence in the culture media of B in contrast to the media of A reservoir, indicating the absence of passive fluidic flux between A ⇒ B (Fig. 3i and Supplementary Figs. 2 and 4) [43, 46]. In our devices, although different α-synuclein bands could be detected in A, the low molecular weight of α-synuclein (≈17 kDa) was mainly detected in B, as also recently reported by (Fig. 3, Supplementary Figs. 2 and 4). α-Synuclein transport was always observed in those devices showing large connectivity between A and B reservoirs (Fig. 3, Supplementary Figs. 3 and 4). However, in those displaying few axon numbers crossing between reservoirs (Supplementary Fig. 3), α-synuclein was almost absent in B (cell and media) and was only detected in the cellular and media extracts of A. This reinforced the notion of a specific axonal transport of α-synuclein fibrils between neurons displaying low endogenous levels of α-synuclein at these time points in culture (Supplementary Fig. 2). Thus, these devices are well suited to monitor cellular transport of mouse or human α-synuclein fibrils. As indicated above, PrPC has been described as a receptor for β-amyloid [4, 49]. Although the participation of PrPC in the intercellular β-amyloid transport in microfluidic devices remains elusive, its expression seems to be needed to trigger β-amyloid-mediated effects in treated neurons (see the “ Introduction ” section for references). 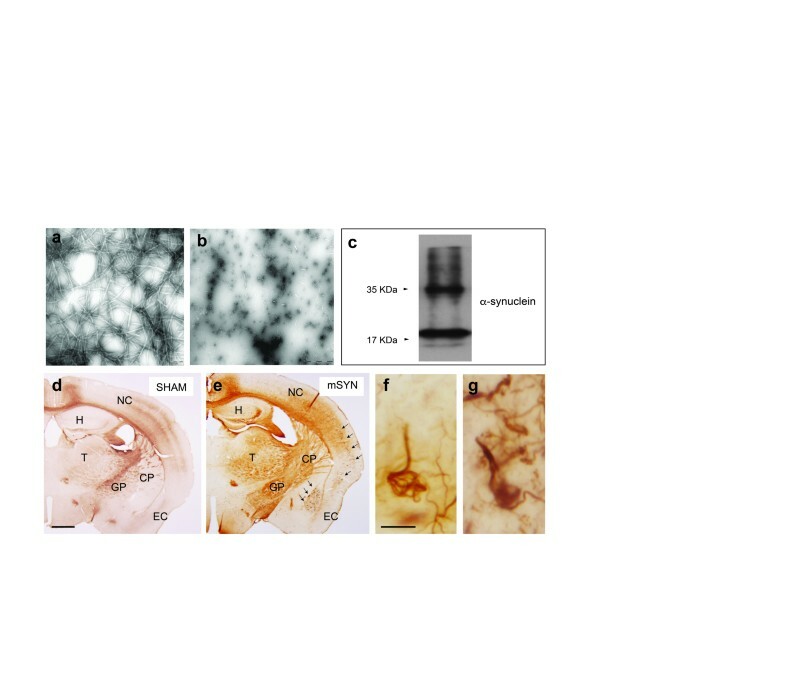 Primary cortical cultures from Prnp +/+ , Prnp 0/0 and Tga20 embryos were treated with exogenous recombinant mouse α-synuclein fibrils, and both the binding in treated cells and their transport was analysed with western blot or immunocytochemistry (Fig. 4). First, we checked the percentage of devices without the α-synuclein transport. Results indicated that 14.28% (Prnp 0/0), 22.22% (Prnp +/+ ) and 16.66% (Tga20) of the cultures showed no α-synuclein transport in our microfluidic devices. In fact, these cultures displayed very few axons crossing between reservoirs as determined by Fluo4-AM staining (see example in Supplementary Fig. 2a). Second, we analysed the presence of exogenous α-synuclein in neurons in B reservoir after treatment in A. We were able to determine the presence of α-synuclein in neurons, irrespective of the Prnp genotype (Fig. 4a–d). Since neuronal presence of α-synuclein fibrils cannot be ascertained in a quantitative basis by simple fluorescence analysis, we processed parallel samples for western blot. Indeed, after protofibril treatment in A, western blots revealed increased α-synuclein/tubulin ratio in Tga20 than in WT and Prnp 0/0 cultured neurons in A suggesting a tendency of higher protofibril binding in presence of larger PrPC amounts (Prnp 0/0 = 0.344 ± 0.07; Prnp +/+ = 0.386 ± 0.08, Tga20 = 0.56 ± 0.14 (mean ± SEM)) (Fig. 4b). Next, western blot results corroborated that α-synuclein protofibrils could be transported to neurons from A to B irrespective of the Prnp genotype (Fig. 4). However, although not statistically significant (ANOVA Bonferroni post hoc test), values for transported α-synuclein were slightly higher in Tga20-derived primary neuronal cultures as compared to wild-type and Prnp 0/0 (Fig. 4c) (Prnp 0/0 = 0.467 ± 0.09; Prnp +/+ = 0.5561 ± 0.106, Tga20 = 0.7801 ± 0.206 (mean ± SEM)). Various possibilities have been proposed regarding α-synuclein interaction with plasma membrane [50, 51, 52, 48]. Thus, due to the in vitro and in vivo observations, we aimed to determine whether PrPC overexpression enhanced α-synuclein interaction with cells (Figs. 5 and 6 and Supplementary Fig. 5). We increased PrPC expression in a cellular system with very low PrPC expression, low endogenous α-synuclein binding properties  and lack of expression of other α-synuclein binding proteins (LAG3, neurexin 1β or APLP1) (HEK293 cells, Fig. 5) to analyse the binding of α-synuclein mouse protofibrils. First, HEK293 cells were transfected with PrPC-IRES-GFP, incubated with sonicated mouse α-synuclein protofibrils (1 μg/ml) and processed for α-synuclein immunolabelling (Fig. 5b). Results revealed that most GFP-positive HEK203 cells were labelled with the α-synuclein antibody (Fig. 5b). In a second set of experiments, HEK293 cells were transfected either with full-length Prnp (pcDNA-Prnp) or mock (pcDNA) plasmids and then incubated 24 h later with mouse α-synuclein fibrils; their cellular binding was analysed using western blot and immunocytochemistry for PrPC and α-synuclein (Fig. 5a, c–h). 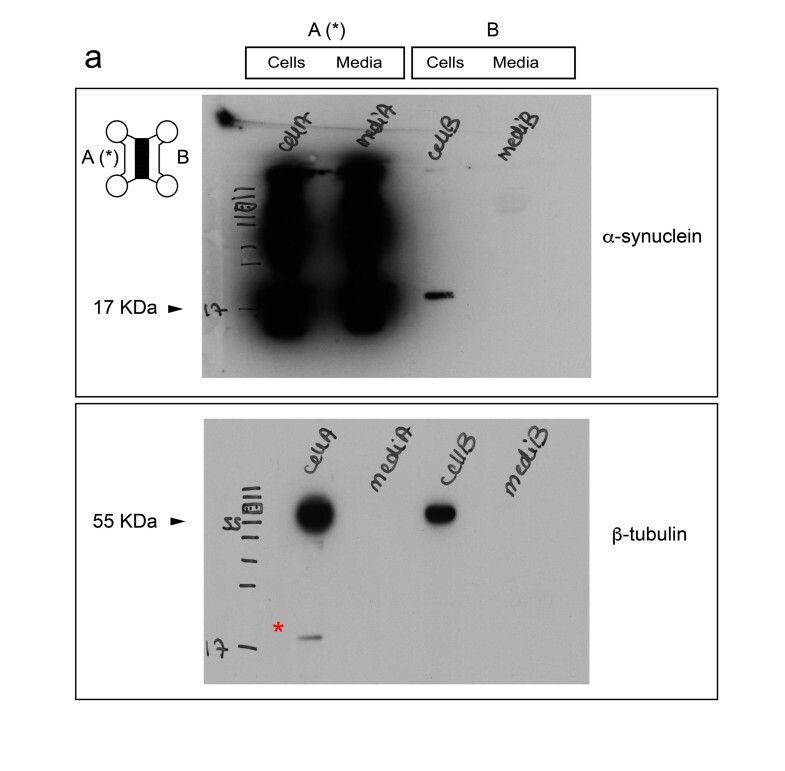 Blots indicated the presence of the 17 kDa α-synuclein band only in protein extracts of Prnp-transfected cells after α-synuclein treatment (Fig. 5a). This increased binding was also corroborated by immunocytochemistry in which α-synuclein labelling was prominent in identified double-labelled Prnp-expressing cells in contrast to non-expressing HEK293 cells (Fig. 5c–h). Fluorescence microscopy observation developed in 314 (PrPC-positive) identified cells from three different experiments demonstrated that 91.08% of the analysed cells with relevant α-synuclein labelling were also positive for PrPC (Fig. 5c, d). In contrast, a discrete puncta-like labelling of α-synuclein was observed randomly distributed over mock-transfected HEK293 cells with negligible levels of PrPC (Fig. 5e). At high magnification, although not exclusive, we determined a strong co-localization of the α-synuclein and PrPC labelling in discrete membrane regions of transfected cells, suggesting relevant cellular binding of protofibrils in regions with high PrPC presence (Fig. 5f–h). It has been described how the residues of the CC of PrPC are involved in binding β-amyloid with PrPC . Hence, we aimed to determine whether this domain also participates in α-synuclein binding (Fig. 6). After cloning, the expression of all PrPC variants in HEK293 cells were tested by western blotting (Supplementary Fig. 5). The endogenous level of Prnp expression in HEK293 was low (Fig. 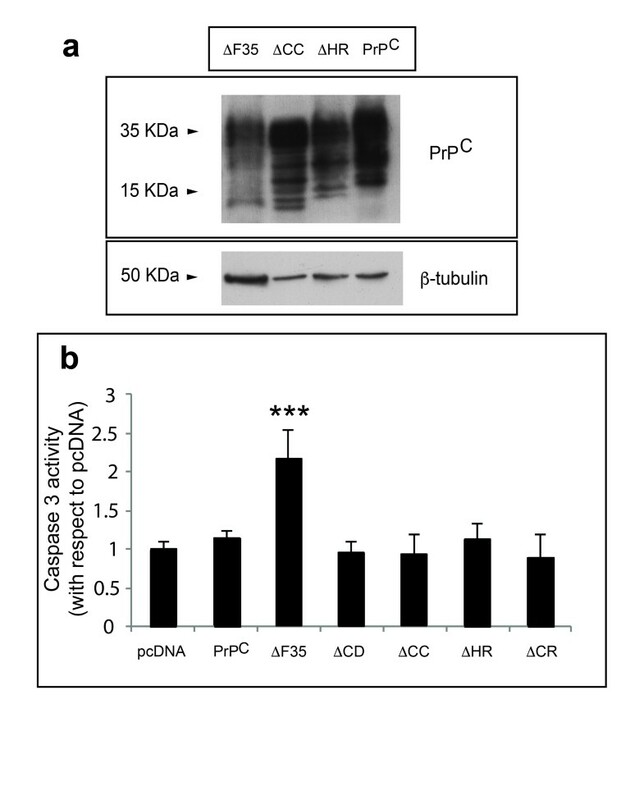 5a), and all PrPC-modified proteins were detectable (Supplementary Fig. 5). However, expression of ΔF35 was markedly lower than that of the rest of the deleted forms, representing less than 50% of the expression of full-length PrPC (Supplementary Fig. 5). At this point, we considered the fact that some of these constructs are able to induce cell death when overexpressed in cell lines [54, 1]. Results indicate that only ΔF35 increased caspase 3 activity in transfected cells in contrast to other PrPC constructs (relative fluorescence units (RFU) ΔF35/pcDNA = 2.15 ± 0.38; ΔCC/pcDNA = 0.92 ± 0.27; ΔHR/pcDNA = 1.11 ± 0.21; PrPC/pcDNA = 1.14 ± 0.09; mean ± SEM) (Supplementary Fig. 5). After these results, we ignored ΔF35 in the next experiments and focused on the central domain (ΔCC and ΔHR) of PrPC (Figs. 5 and 6). In the experiments, we reduced the amount of the cDNA to half during cell transfection to ensure clear immunocytochemical detection of transfected cells. After transfection and immunocytochemistry, only 5.83% (22 of 377, n = 3) of the ΔCC-labelled cells were α-synuclein-positive (Fig. 6d–g) in contrast to ΔHR/α-synuclein (96.49% (110 of 114, n = 3)) (Fig. 6h–k) and PrPC/α-synuclein (91.08% (286 of 314 cells, n = 3) (Fig. 5c–h and Fig. 6b, c), indicating the participation of the CC domain of PrPC in α-synuclein binding to PrPC-transfected HEK293 cells. In this study, we determined that α-synuclein fibrils can be transported to different brain regions of wild-type mice after injection in the postcommissural striatum. Our results reinforce the notion that the spreading of p-α-synuclein pathology does not occur by diffusion or non-specific transport . The transport observed in our experiments was similar to that reported in other studies using wild-type mice [29, 28], with relevant p-α-synuclein deposits in the striatum, substantia nigra, amygdala and neocortex. The anatomical connections between the striatum, substantia nigra, amygdala and neocortex are well described in the literature (e.g. ) and support the observed transport of α-synuclein. Although it has been reported to exist anterograde and retrograde transport of α-synuclein (see above), in our experiments, transported α-synuclein seemed to be more often transported retrogradely in the brain parenchyma, as suggested in other works [29, 28]. Our results also demonstrate for the first time that p-α-synuclein pathology after injection could spread to different brain regions in the absence of PrPC. Thus, Prnp expression is not mandatory for α-synuclein transport in the mouse brain, although increased levels of α-synuclein transport can be seen in wild-type and overexpressing mice. In fact, it has been reported that the absence of PrPC does not modify the appearance or temporal evolution of p-α-synuclein deposits in transgenic mice overexpressing human α-synuclein driven by a platelet-derived growth factor-β promoter . Furthermore, changes on Prnp dosage do not alter α-synuclein expression in adult mice (not shown). Although data using additional models of synucleinopathies (e.g. A53T mice) have not been published, the present results are in line with these observations . However, we also determined an increased number of motor pyramidal neurons displaying LBL aggregates in Prnp-overexpressing mice which suggest that, as also reported for β-amyloid, PrPC might participate in the cellular binding of α-synuclein and its expansion. The interaction of several amyloids to PrPC is well characterized [14, 6, 4, 15, 16, 17]. We determined, using two different Prnp constructs, that their overexpression can enhance the binding of α-synuclein in HEK293 cells with low endogenous capability of α-synuclein binding (see also  for details). Several studies have reported the interaction of endogenous peptides of the amyloid family with the plasma membrane [57, 58, 59, 60, 61]. In fact, the interaction of Aβ, human or rat amylin, PrP(106–126) or α-synuclein fibrils with plasma membrane has been well described [57, 58, 59, 60, 62], and several putative interactions with plasma membrane proteins have been described as well (e.g. APP  or GRP78 ). To this concern, a recent study of Mao and coworkers  reviewed in  points to the lymphocyte-activation gene 3 (LAG3/CD223) as the neuronal receptor of α-synuclein. LAG3 showed increased binding properties to α-synuclein protofibrils as compared to neurexin 1β, and APLP1 in SH-SY5Y-overexpressing cells . mRNA levels of LAG3 do not change between Prnp genotypes (GEO database ref. GSE16223). However, and since a functional interaction between LAG3 with PrPC cannot be ruled out, we hypothesise that PrPC as well as other proteins (e.g. GRP78) may cooperate with LAG3 in neuronal α-synuclein transport. This is also relevant if considered that the absence of LAG3 does not fully impair α-synuclein protofibril transport in vitro and in vivo . Although not described for other fibrillar peptides, PrPC has been reported as a receptor for Aβ (see above). The present study indicates that PrPC might contribute to enhanced binding of α-synuclein fibrils to the plasma membrane, in line with other studies, reporting an increased level of binding between Aβ and PrPC during ageing in several mouse models of Alzheimer’s disease . In addition, our data suggest that the CC domain actively participates in α-synuclein binding. Residues located in the CC domain (aa 90–110 or aa 91–115) have been involved in binding with β-amyloid [64, 53] in cooperation with the N-terminal residues 23–58 . As these PrPC domains have been revealed as putative pharmacological targets for Alzheimer’s disease [65, 66, 67], our data might also enhance the eligibility of PrPC as a putative target to modulate α-synuclein expansion. The authors thank Tom Yohannan for the editorial advice and the IBEC Nanotechnology Platform staff for their generous help. This research was supported by grants from the Spanish Ministry of Economy and Competitiveness through the project (BFU2015-67777-R) (MINECO/FEDER), the Spanish prion network (Prionet Spain, AGL2015-71764-REDT) (MINECO/FEDER), the Generalitat de Catalunya (SGR2014-1218), CIBERNED (PI2014/02-4 (Rapid dementias), PRY-14-114 and PRY2016-02, La Caixa Obra Social Foundation and La Marató de TV3) to J.A.D.R. J.M.G.A. was supported by the European Research Council (ERC) through the project ERC-2012-StG 306751 and the MINECO (DPI2015-64221-C2-1-R). M.V. was supported by Fondo de Investigación Sanitaria-Instituto de Salud Carlos III. E.T. was supported by MINECO/FEDER (BIO2015-63557-R). I.F. was supported by the Seventh Framework Programme of the European Commission, grant agreement 278486: DEVELAGE and Instituto de Salud Carlos III–Fondos FEDER, a way to build Europe FIS PIE14/00034 and PI14/00757. J.S. was supported by the Seventh Framework Programme of the European Commission, grant agreement 228685-2: BOND and Instituto de Salud Carlos III (PI10/01171); MINECO/FEDER (TEC2015-72718-EXP) and the Botín Foundation. M.S.-F was supported by CIBERNED, A.H was supported by La Caixa Obra Social Foundation and L.U. was supported by a fellowship from the Marató TV3 foundation. L.P. is grateful to the Generalitat de Catalunya for its financial support through the FI Programme (2015-FI-B-00817).